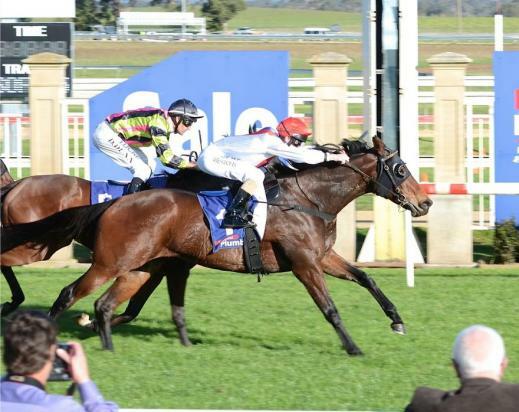 Stable favourite Pass the Post scored an exciting win second up at Sale on Thursday in the Pastry & Pieces Bm 64 Handicap (1411m) at the odds of 15/1. Starting from the outside barrier and carrying top weight of 60.5 kg after promising apprentice Beau Mertens 2 kg claim, she won by a long neck from the favourite Scorpio and a further length back to La Consolidata. Beau Mertens gave her a great ride getting her across with cover stalking the favorite Scorpio until unleashing her down the straight to win going away. It has become a family affair with both Peter and Beau riding Pass the Post to victories. Peter rode her to victory at Caulfield as a three year old. The six year old mare has been a lot of fun for connections who have been great supporters of the stable for many years. Having start forty, it was her sixth win with five seconds and five thirds and $120,198 in prizemoney. Pass the Post will next race over her preferred distance of 1600m in June.